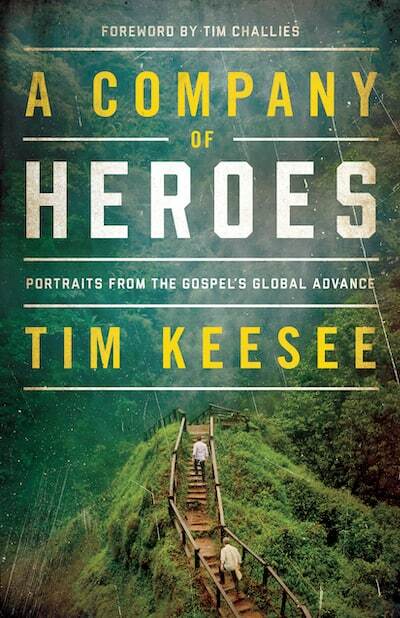 I write this review of Tim Keesee’s new book A Company of Heroes at the end of a year-long journey around the world. Twelve times in the past year I boarded a plane and began a long journey to a distant nation. Twelve times I disembarked and got oriented and began a search—a search for objects related to the long and storied history of the Christian church. I scoured colleges and cathedrals, libraries and museums, always on the lookout for objects that would tell a story beyond themselves. I found some incredible artifacts. In the National Archives of Northern Ireland I found the Bible that Amy Carmichael had pored over for so many years as a bedridden invalid in southern India. In a little museum in England I found the snuffbox Andrew Fuller had pulled from his pocket and passed around the room as a makeshift collection basket upon the founding of the Baptist Missionary Society. In a new exhibit in China I found Hudson Taylor’s gravestone which for so many years had been lost, discarded and covered over by the Communist government. I found all these and so many more. It was an inspiring year. Yet over the course of the year it slowly dawned on me that I was discovering an even better, ever more precious treasure. Everywhere I went I met Christians. I landed in a major city in China and was immediately welcomed for a meal by the pastor of an underground church. I landed in Australia and was invited to stay with some newlyweds who had prepared a spare bedroom specially for me. I flew over to Auckland, New Zealand, and was invited to stay as long as I wanted in the home of some believers there. In England, and India, and South Korea brother and sisters in the Lord gladly gave up their time to drive me many miles and to provide personalized tours. I joined into formal or informal worship services in Brazil, Ecuador, Israel, the Philippines, South Africa, Zambia and elsewhere. I came to learn that even though those storied treasures of church history are inspiring and worth seeing, the greatest treasures can’t be found behind glass in museums. The most valuable artifacts of the history of the Christian faith aren’t neatly labeled in library stacks. The most enduring relics aren’t boxed up in dusty basement archives. Those objects are wonderful and inspiring and worth pursuing around the world. But the true treasure is found in those posh edifices and ramshackle huts we call churches. The greatest treasure is God’s redeemed people. For years now, Tim Keesee has been scouring the world for that kind of treasure. His search has led him to pastors in the world’s most dangerous nations, to missionaries who have left behind family and comfort to take the gospel to distant lands, and to people in his own hometown who have labored silently but faithfully. Much of his search is documented in his incredible Dispatches from the Front series of videos that I’ve watched and recommended countless times. More recently I’ve been thrilled to see him also begin to document it in books like this one. With one eye on the present and one on the past, he powerfully tells the stories of dedicated men and women from today and days gone by. I encourage you to join him on this journey and to come to see and know the greatest treasures in the world.